For other bodies with the title Wesleyan Methodist Church, see Wesleyan Church (disambiguation). 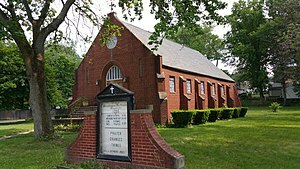 The Allegheny Wesleyan Methodist Connection (AWMC), originally the Wesleyan Methodist Church (Allegheny Conference), and also known as the Wesleyan Methodist Church, is a Methodist denomination within the conservative holiness movement primarily based in the United States, with missions in Peru, Ghana, and Haiti. Statue of John Wesley in Savannah, Georgia, where he served as a missionary. The movement which would become Allegheny Wesleyan Methodist Connection began in the mid-18th century within the Church of England. A small group of students, including John Wesley, Charles Wesley and George Whitefield, met on the Oxford University campus. They focused on Bible study, methodical study of scripture and living a holy life. Other students mocked them, saying they were the "Holy Club" and "the Methodists", being methodical and exceptionally detailed in their Bible study, opinions and disciplined lifestyle. Eventually, the so-called Methodists started individual societies or classes for members of the Church of England who wanted to live a more religious life. People are all by nature dead in sin. Very quickly these Methodist clergymen became popular, attracting large congregations. The first official organization in the United States occurred in Baltimore, Maryland, in 1784, with the formation of the Methodist Episcopal Church at the Christmas Conference with Francis Asbury and Thomas Coke as the leaders. The ordination of Bishop Francis Asbury by Bishop Thomas Coke at the Christmas Conference establishing the Methodist Episcopal Church, 1784. Though John Wesley originally wanted the Methodists to stay within the Church of England, the American Revolution decisively separated the Methodists in the American colonies from the life and sacraments of the Anglican Church. In 1784, after unsuccessful attempts to have the Church of England send a bishop to start a new Church in the colonies, Wesley decisively appointed fellow priest Thomas Coke as superintendent (bishop) to organize a separate Methodist Society. Together with Coke, Wesley sent The Sunday Service of the Methodists, the first Methodist liturgical text, as well as the Articles of Religion, which were received and adopted by the Baltimore Christmas Conference of 1784, officially establishing the Methodist Episcopal Church. The conference was held at the Lovely Lane Methodist Church, considered the Mother Church of American Methodism. The Allegheny Wesleyan Methodist Connection specifically traces its origin to the Wesleyan Methodist Church which was a Methodist denomination in the United States organized on May 13, 1841. The church withdrew from the Methodist Episcopal Church because of disagreements regarding abolitionism, church government, and the doctrine of holiness according to the Discipline of the Wesleyan Methodist Connection (1841). The first secessions in 1841 took place in Michigan although the new church group was formalized in Utica, New York. In November 1842, Orange Scott, La Roy Sunderland and J. Horton seceded from the M. E. Church for reasons given in their publication of the "True Wesleyan." The following month Luther Lee and L. C. Matlock followed. The first general conference was held in Utica, NY in October, 1844. Later the name was changed to The Wesleyan Methodist Connection of America. The Allegheny Conference of the Wesleyan Methodist Church entered into a schism with the rest of the Wesleyan Methodist Church because it favored a connexional polity and opposed the merger of the Wesleyan Methodist Church with the Pilgrim Holiness Church; it thus became the Allegheny Wesleyan Methodist Connection while the rest of the Wesleyan Methodist Church became the Wesleyan Church. While it officially operates under the name "Allegheny Wesleyan Methodist Connection (Original Allegheny Conference)" due to an agreement during the merger between the Wesleyan Methodist Church and the Pilgrim Holiness Church in 1968, most of the churches continue to be called Wesleyan Methodist. A service of worship at the tabernacle of a camp meeting of the Allegheny Wesleyan Methodist Connection, held at Wesleyan Methodist Camp in Stoneboro, Pennsylvania. In 1900 the Allegheny Conference of the Wesleyan Methodist Church purchased land in Stoneboro, Pennsylvania to be used for a camp meeting ground; it is known as Methodist Campground. Located next to this campground is the Stoneboro Wesleyan Methodist School which was built in 1965. The denomination continues to hold its annual conference at its campgrounds in the month of June, and its historic annual camp meeting in the month of August. The Conference has other smaller campgrounds that also hold camp meetings throughout its geographic territory, such as the smaller campground located in Belsano, Pennsylvania. It operates Allegheny Wesleyan College, a four-year Bible college dedicated to preparing Christian ministers, missionaries, and teachers. It is located in Salem, Ohio. Allegheny Wesleyan Methodist Connection also runs Northwest Indian Bible School (NIBS) in Alberton, Montana. In addition, the Allegheny Wesleyan Methodist Connection has sixteen Christian schools in Pennsylvania, Ohio, Montana, and New Mexico. The Allegheny Wesleyan Methodist Connection runs 33 missions, with 20 more missions being added since 1968. These are located in Haiti, Ghana, Peru, as well as among Native Americans of the United States and Canada. The Allegheny Conference of the Wesleyan Methodist Church publishes a monthly periodical known as The Allegheny Wesleyan Methodist. It also runs a radio program known as Wesleyan Gospel Echoes. ^ "Origins: Christmas Conference". Greensboro College. Archived from the original on 2008-07-06. Retrieved December 24, 2007. ^ "Wesleyan Methodist Church of America." Encyclopædia Britannica. 2009. Encyclopædia Britannica Online. 11 April 2009 <http://www.britannica.com/EBchecked/topic/639965/Wesleyan-Methodist-Church-of-America>. ^ Kurian, George Thomas; Day, Sarah Claudine (14 March 2017). The Essential Handbook of Denominations and Ministries. Baker Publishing Group. p. 318. ISBN 9781493406401. ^ Knight, Henry H. (11 August 2010). From Aldersgate to Azusa Street: Wesleyan, Holiness, and Pentecostal Visions of the New Creation. Wipf and Stock Publishers. p. 294. ISBN 9781606089880. ^ a b c d e f Kostlevy, William (1 April 2010). The A to Z of the Holiness Movement. Scarecrow Press. p. 3. ISBN 9781461731801. ^ Melton, J. Gordon (2003). Encyclopedia of American Religions. Gale. ISBN 9780787663841.